Micronutrients are vitamins and minerals and are so called because we don’t need them in big amounts like macronutrients which are protein, carbohydrates and fats – which we need in big amounts. They enable the body to produce enzymes, hormones and other substances which are essential for proper growth and development. Micronutrients are essential to life – so essential that people in the know have formulated recommended consumption levels called recommended daily allowances (RDAs). These allowances are not the amount needed for optimum health but rather the levels needed to prevent deficiency diseases. Therefore the average adult should obtain more than the RDA from food and supplements. Even though Micronutrients are only needed in tiny amounts, the consequences of having a deficiency of one or more of the micronutrients are severe. Iodine, Iron and Vitamin A are so important that having a lack of them in the body represents a major threat to the health and develpment of the world's population. This is especially true in pregnant women and children in low-income countries. Deficiencies of micronutrients are commonly associated with chronic hunger. A lack of iodine, iron and vitamin A have a negative effect on children's physical and mental develpment leading to stunted growth, poor cognitive function and poor school performance. Children are also more susceptable to infection because their immune system is impaired. Severe deficiencies of micronutrients can lead to retardation, blindness and even death. These instances above mean that you’ll need a higher than normal amount of micronutrients and should consider taking vitamin supplements. A good multivitamin contains all the essential micronutrients needed by the body. Vitamins are micronutrients which help to sustain life. 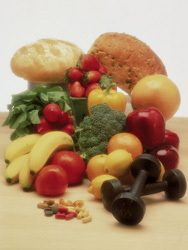 There are 2 types of vitamins: water-soluble and fat-soluble. Water-soluble vitamins need to be replenished constantly as they are excreted and can not be stored. Thay are Vit C and B-complex vitamins. Fat-soluble vitamins can be stored in the fatty tissue and liver, although they also need to be replenished. They are vitamins A,D,E and K.
Minerals are essential micronutrients which originate in the earth and can not be made. Plants get minerals from the soil and most of our minerals comes directly from plants or indirectly from animal sources. We also get minerals from the water we drink. There are 2 types of these micronutrients: Major and trace minerals. Major minerals are those that we need in greater amounts - such as calcium, magnesium, phospherous and sodium. Trace minerals are required in amaller amounts. They are iron, copper, zinc, selenium and iodine. Here is a handy vitamin and mineral chart which helps explain the importance of the major micronutrients as well as information on dietry sources, signs of deficiency and excess. Why not become part of the Healthy Eating Website! All you do is tell your story - perhaps about how a deficiency or excess of micronutrients has affected or changed your life. Share your story or recipe right here!